... 1891 (120 years ago today), a son was born in Los Angeles, California, to an immigrant couple -- a mother born in Sweden and a Norway-born father who worked as a railroad car repairer and inspector. They would move to the Central Valley town of Bakersfield, where the father "slipped into the way of an eccentric who did not live with his family," and the son worked odd jobs while attending public schools. The son, Earl Warren (left), earned law degrees from the University of California, Berkeley, served in World War I, and then began a career in law and Republican politics that culminated in his 1953 appointment to be the 14th Chief Justice of the United States. 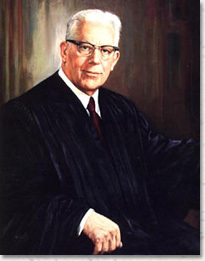 Though he'd served as a prosecutor and also supported the World War II internment of Californians of Japanese ancestry, the Supreme Court over which Warren presided is known to this day for its pathbreaking recognitions of the rights of the accused and its condemnations of racial segregation. (image credit) Most noted among the latter is Brown v. Board of Education (1954), an opinion that Warren wrote after securing a unanimous holding that the segregation of schools by race is, in his words, "inherently unequal." Warren died at age 83 in 1974, 5 years after his retirement from the bench.